Please join us on the morning of Wednesday, October 29th, at the US Court of Appeals for the 5th Circuit (600 Camp St.) in New Orleans for oral arguments about whether or not to uphold Judge Brady’s January 2014 ruling that put an end to the invasive, dehumanizing strip and cavity searches Albert had been tortured by since May of 2013. As you may remember, this is the second of two outstanding appeals of rulings in A3’s favor that have frozen progress towards the final trial prep stages of the decade long A3 civil case, which seeks to establish long term solitary as the unconstitutionally cruel and unusual punishment the A3 know it to be. The cruel and rather perplexing irony of this corner of the civil case is that it was a lawsuit that Albert himself filed and won in 1978 that put an end to the demeaning practice for decades, until two months after his conviction was overturned for a 3rd time. It was then that prison officials at David Wade Correctional Center, where he is currently being held, inexplicably began to again routinely strip and cavity search Albert every time he left or entered his cell, even if he was shackled and had no contact with anyone besides prison officials. In his ruling, Judge Brady found that these frequent, routine searches were not shown to be “necessary” or “justified” for security as is required constitutionally of such policies, and therefore “Woodfox’s human dignity [as] protected by his Fourth Amendment rights” outweighed any “legitimate penological interest.” The State disagrees and is fighting to reinstate the searches. If you are in town and able to attend, the proceedings are open to the public. Doors open at 8am and court convenes at 9am in the West Courtroom, room 265. Although listed second on the schedule for the morning, there is no telling the exact time our case will begin, so it is better to arrive early, but be prepared to potentially stay all morning. Arguments themselves are expected to be very short–30 minutes or less per side. Seating is limited, and formal dress and conduct are both required and strictly enforced by Federal Marshals. For those unable to attend, the hearing will be recorded by the Court and we will circulate a link to the proceedings as it becomes available. 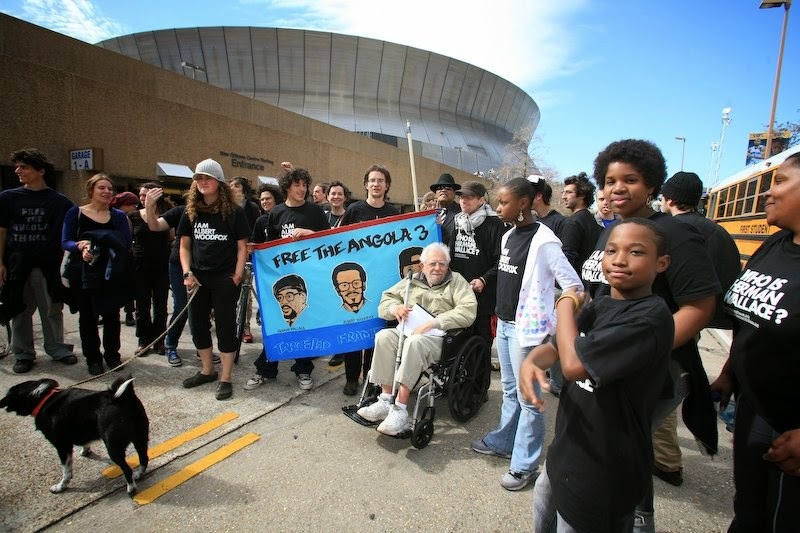 Last week Albert filed another civil action, separate from the larger A3 civil suit, seeking to hold the Louisiana DOC and prison officials at Elayn Hunt Correctional Center (which you may remember as the prison where Herman spent his last years) to account for the 13 harrowing days he spent in the dungeon there before, during, and after his May 2012 habeas hearing in Baton Rouge. Albert’s complaint details multiple egregious violations of his 1st, 8th, and 14th Amendment during his stay at Hunt. In addition to denying him access to yard time, TV, phone, visits, canteen, and confiscating the basic clothes and hygiene products he was allowed to bring with him; Albert was served inedible food, including at least one meal served still frozen in a block of ice, and forced to wear leg shackles without socks which caused severe cuts and bruises on his ankles that took months to heal. Most importantly the harsh conditions, extreme heat, and continuous screaming and moaning from other inmates tortured by their punishment in dungeon cells nearby, prevented Albert from participating fully in the hearing that would determine his freedom, resulting in significant mental and emotional anguish on top of the very real physical suffering he endured. We will keep you updated as this important new challenge moves along through the courts. Last week, a Black Panther Party Legacy Celebration was held in Kansas City. Organized by Its About Time BPP, the range of activities included a panel entitled “The Reality of Political Prisoners in America,” which featured Robert King alongside Yasmeen Sutton and Charlotte O’Neal. 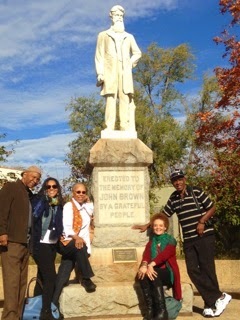 Featured in the photo above, taken next to the statue of John Brown, from left to right are: Robert King, Yasmeen Sutton, Barbara Easley Cox, Kathleen Cleaver and Clark Bailey. The Louisiana State Penitentiary at Angola, a three-day trek designed to raise money for a bus service that allows families to visit loved ones in the state’s prison system. The 170-mile trip underscores the point that the fourth annual “Nola to Angola” ride is trying to make: If you think it’s far on a bike, imagine the gulf for the thousands of inmate relatives in the New Orleans area who don’t have a car to make the drive. Gillies said Orleans Parish Prison has many inmates who were arrested on nonviolent offenses but who have to remain in jail because they cannot afford to post bond while they await trail. As the state’s high incarceration rate takes its toll on inmates’ lives and their communities, she said, the downward spiral that often begins at the entry level of the prison system can end with offenses that lead to life sentences at Angola.”We really want to highlight the connection,” she said. Gillies said people interested in donating to the cause can do so through the group’s website, nolatoangola.org, because the ride is essentially an event to draw attention to the year-round bus rides program. She said the bike riders pay a registration fee and supply their own food, so all of the money donated goes to the cause. that kill our children in the night? Murder our brothers in broad daylight? to see ourselves in them? And does this scare us? *Cracker: from the crack of the whip wielded by slave drivers. Today marks one year since Herman’s lifelong struggle for justice from the courts finally granted him a few days of freedom. Please join with us as we cry out in remembrance of Herman’s life and legacy, and as we draw inspiration from his spirit to now fight even harder for Albert’s release. 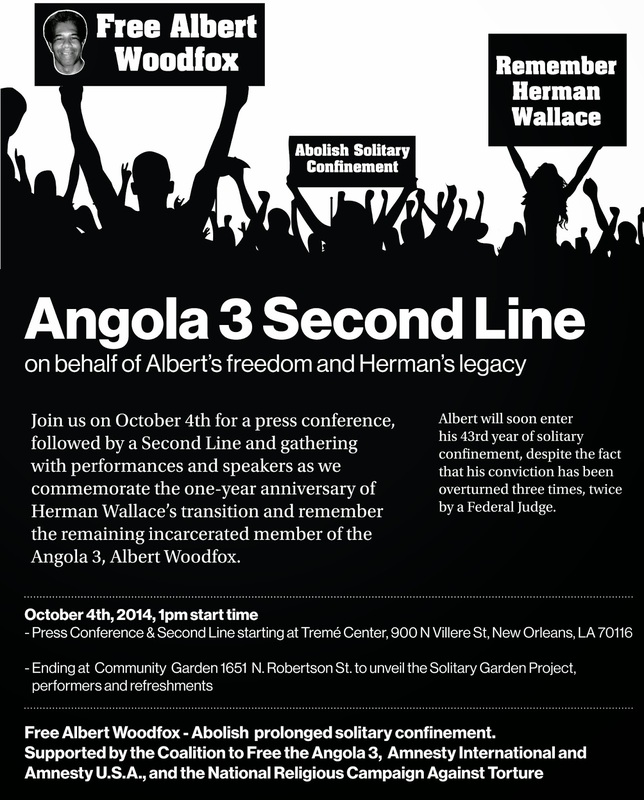 Join us on October 4th for a press conference, followed by a Second Line and gathering with performances and speakers as we commemorate the one-year anniversary of Herman Wallace’s transition and remember the remaining incarcerated member of the Angola 3, Albert Woodfox. The event begins at 1pm, with the press conference & Second Line starting at Tremé Center, 900 N Villere St, New Orleans, LA 70116. It ends at Community Garden 1651 N. Robertson St. to unveil the Solitary Garden Project, performers and refreshments. 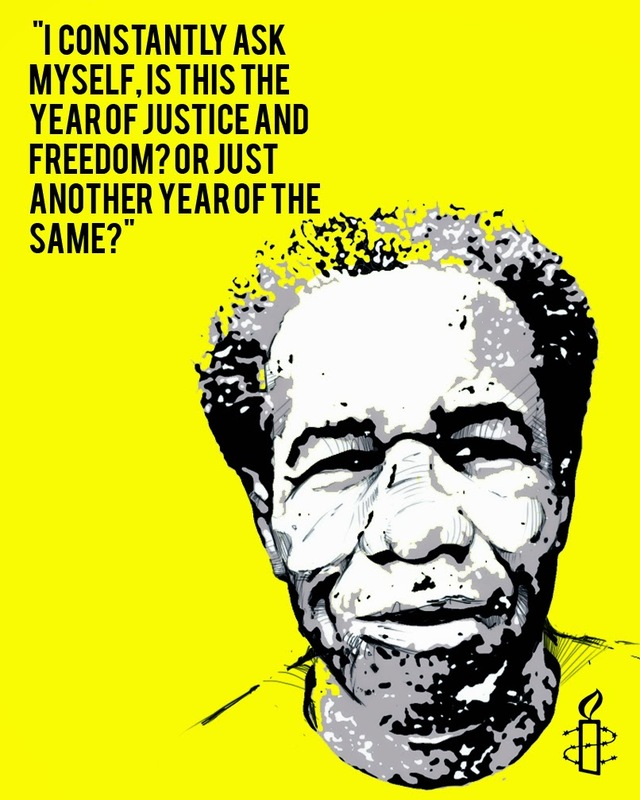 As we prepare to celebrate the anniversary of Herman’s 4 days of freedom and honor his lifetime legacy of sacrifice, Albert still sits in a solitary cell awaiting word from the 5th Circuit as to whether his third overturned conviction will stand. Although final preparation and trial dates for the A3 civil case are also frozen pending 5th Circuit decisions on State appeals of A3 wins in Brady’s court, those appeals continue to grind forward. On Wednesday, October 29th, the 5th Circuit will hear oral arguments on the second issue holding up progress in the civil case–the State’s attempt to reverse Brady’s decision from last spring in Albert’s favor that put an end to the invasive, dehumanizing strip and cavity searches Albert had been subjected to every time he left or entered his solitary cell. Once both issues are heard and decided, the civil case will be ready to move forward to its final trial phase. We will update you as soon as we have more information on either civil case appeal, or Albert’s valiant, seemingly endless, fight for freedom. Read our new interview with Prof. Bell here. Breath in, breath out, as the page turns again. Time on the other side of the wall. More seasons than I can recall. To tear the wall down? We call out to the many names of our Creator for your strength. We call out words of gratitude for your courage and your love. Of the inhumanity that built and builds these walls. We cry out in anger for justice deferred. We shout out in hope for freedom to come. Here we stand, on both sides of the wall.